Stock palao or u can say yakhni palao its very tasty once u try it u want to make it again and again. Put mutton, peeled whole onions,garlic pod and water in a pot to make stock.Put coriander seeds,fennel seeds,cumin seeds and blk cardamoms in a muslin cloth; tie it up in a knot and leave it in the pot. When mutton becomes tender remove it from from stock.Sieve the stock and set it aside. In a separate pot heat oil and fry the sliced onions.When they turn golden take out half of them and keep it aside. Add ginger garlic paste,green cardamoms,green chillies and yogurt in it. Fry for five minutes and then add stock. When stock comes to a boil, add soaked rice and salt now stirr it. Cook rice till it is almost ready and all the water has dried up. Put the pot on a tawwa and keep on dum. 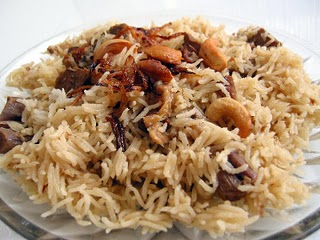 When steam starts to rise, take the rice out in a dish and garnish with fried onions.Serve with raita. yes u can make this recipe with chicken. Very yummy tried it out thankxxx for sharing salam. yummy can I use chicken instead of mutton for the same recipe?